The all new Hyundai i-30 is the brand's ambassador for all things better. Roomier, exceptionally equipped and an improved drive, this redesign is a great competitor in its class challenging its peers like the Ford Focus and the VW Golf. It is an affordable, capable and credible alternative to some of its more established rivals. We are eagerly anticipating its launch in 2017, the redesign and improved driving experience are all key elements we just can’t wait to hit our forecourts. Where it may be slightly more expensive than its predecessor it is also noticeably different and compared like-for-like with key rivals it actually costs less and offers you more. 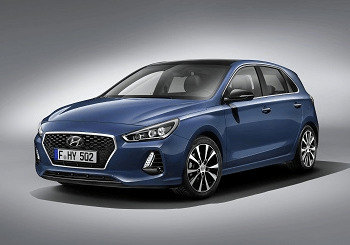 The South Korean manufacturer have really refined the face of the i30 and in doing so have made it much more appealing to the mainstream, making it available in 12 exterior colours. There is no compromise on space where the i30 is concerned, both passengers and luggage will not be feeling squeezed in! The new design has a mega focus on comfort for all those involved. With a luggage capacity of 395 litres and a potential of 1301 litres when the 40:60 split seats are folded flat, a practical two-stage luggage board and ski hatch through the central seat makes this boot space all kinds of versatile! With lots of additional cubby holes, mostly lined with soft materials to stop that pesky rattle you’ll never be stuck for handy storage options, this includes a really handy addition of storage in the adjustable armrests! An option of a panoramic sunroof is also available and, as you may imagine, adds even more roominess and light to the interior of the car. For enhanced comfort, the front seats come with the option of a three stage heating or cooling system, and can also be adjusted in 10 ways including lumbar support and a memory function for two positions. Comfort and practicality are key to the new Hyundai’s character. Hyundai has responded really well to the technology evolution that we are seeing across all ranges of new cars. The have extended their already comprehensive list of assistive and safety features. They have kept up to date with the connectivity, media and assistive details and offer an impressive amount of features for your money. These are just some of the highlights which make it a car with one of the most advanced safety packages. The second Gen Hyundai was awarded the five-star safety rating in Euro NCAP’s impact assessment programme and the new i30 is a match for the structural durability and stability, that being said, we’d predict the new i30 will be eligible for top safety ratings. Flex steer with three settings of Comfort, Normal and Sport allow for a fully adaptive driving experience. Chassis engineering - a stiffer chassis has allowed for a much more secure and intuitive driving experience. All disc braking system offer a reassuring stopping system. Five Year unlimited mileage warranty - so you don’t have to worry. Later in 2017 there will be a hot hatchback version of the i30 which is meant to be called the Hyundai RN30, it'll be the first car to be produced by Hyundai’s newly founded N performance division and it will be boasting a highly tuned engine, adapted chassis, 250 bhp and be tested to perfection on the Nurburgring race circuit. 17” Alloy wheels and dual-zone climate control. LED front headlights and rear combination lights. At Premium trim level, the 1.4 T-GDi with a 7 speed DCT transmission and a 1.6 CRDi 110PS engine with either a 6-speed manual or 7-speed DCT transmission are also available. Premium SE is also available with the 6 speed manual, 7 speed DCT transmission, with either the 1.4 T-GDi 140PS or 1.6 CRDi 110PS.